A honey bee colony consists of a queen, worker bees, male bees. Honey bees are 1/2”-3/4” long, with black and amber looking stripes, and a fuzzy body. The worker bees can often be seen carrying yellowish sacks of pollen on their back legs. Female worker bees can sting one time and will leave the stinger. The male bees, which are called drones, cannot sting and are fatter than the worker bees. Honey bees are typically gentle and are not prone to attack unless they have africanized traits. 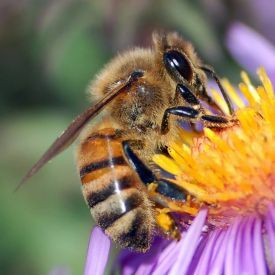 Africanized bees have only been found in small numbers in Alabama, Georgia, and South Carolina. Still, caution should be used when around a honey bee nest. In the springtime and early summer (March – June) a colony of honey bees will split and multiply in a process called swarming. The old queen will leave with thousands to tens of thousands of worker bees. The old colony will raise a new queen. The bees that leave the hive are called a swarm. These bees will land on a nearby branch, bush or other object. It will look like a big bee nest comprised of only bees. They then send out 100s of scout bees to find the best suitable nesting location. Honey bees do not nest in the ground. They need a fairly large, dry dark cavity and prefer a location several feet or more off the ground. A swarm will usually be in a place no longer than one to three days. Upon picking the permanent location, the swarm of bees will suddenly leave and can move into their new home in very short order, as in an hour or less. Most people will not be around to witness this event but if you are it can be quite startling and unusual. You may see a humongous cloud of bees and hear a loud sound of buzzing as the bees move together. Then just like that the bees have moved in and you may only see a handful of bees coming in and out of the entrance. A healthy colony can live in a place for years, even decades. A honey bee colony of one or two years old can consist of 60,000 plus bees and have up to a 50-100lbs of honey in their hive. Older colonies can grow even bigger. 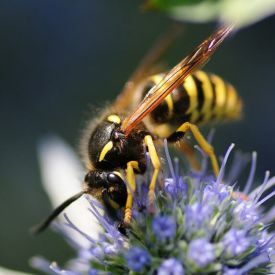 Yellow jackets are considered part of the wasp family. The workers are around ½ inch long and are often confused with honey bees when flying in and out of their nests. Yellow jackets are thinner than honey bees, do not have hair, do not carry pollen, and have pronounced yellow and black stripes. Their wings and antennas are slightly longer than a honey bee’s, too. Yellow jackets will nest in the ground, soft dirt, tree stumps, pine straw, mulch, railroad ties, and other such places. 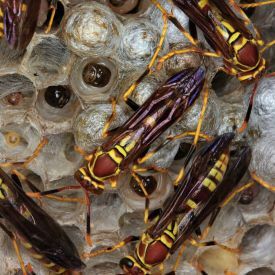 Some yellow jackets, known as aerial yellow jackets, will make their nests in walls, floor joists, and eaves of homes 25 plus feet off the ground. 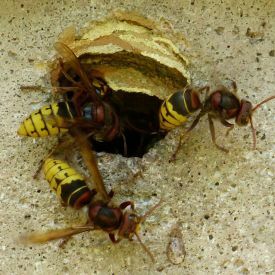 Yellow jackets make their nests by chewing wood fiber into pulp. When nesting in a structure, this papery-like nest can sometimes be seen extending outside of the entry point. Yellow jackets are able to sting multiple times and can be quite aggressive especially in late summer when their population is at its highest, around 5,000. A yellow jacket nest is a lot smaller than a honey bee nest, usually the size of a volleyball or basketball. Yellow jackets typically die out in the winter except for the queens that hibernate and begin building new nests in the late spring and early summer. In southern Alabama and southern Georgia and other warmer areas, nests can sometimes survive the winter and grow very large. Unlike honey bees, yellow jackets will not reuse an old nest. Bald-faced hornets are primarily black with some white markings on their body and face, whereby they get their name. These hornets are about 1” long and there can be 500 plus hornets in one nest. The nests are gray and cone-shaped with a hole toward the bottom. Bald-faced hornets build their nests by chewing wood fiber and mixing it with their saliva. A full grown nest can reach a size of about 12 inches wide and 18 inches long. Common places to see nests are tree limbs, bushes, and under eaves of houses. Nests are built out in the open and not inside of structures. Bald-faced hornets do eat predatory insects such as spiders, caterpillars, and flies. However, they are very defensive and can pose a threat if near human activity. A unique defense feature is that they are able to squirt venom into the eyes of intruders, causing watering of the eyes and temporary blindness. Like yellow jackets they are able to sting repeatedly. Also, as the weather gets colder in the fall, the workers die off as queens are raised. These queens will survive the winter and build new nests in the spring. European hornets are closely related to Japanese hornets and are the only true hornet in North America. They are very large, at approximately 1.5 inches in length, with a yellow and brown striped abdomen and a reddish orange-looking body. They build their nests inside of hollow trees and can also be found inside man-made structures. Overall, they are not very common. In some places such as Germany it is illegal to kill a European hornet nest. European hornets feed on large insects and have been known to deplete entire honey bee colonies. While doing a honey bee removals, I have actually seen these hornets come and carry off honey bees. 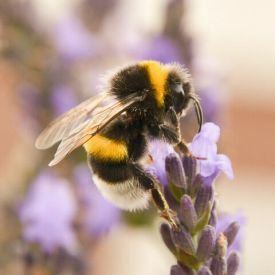 Bumble Bees are very beneficial to our environment. They are able to pollinate plants that honey bees do not. Bumble bees are not aggressive and it is best to leave their nests alone if possible. They usually nest in the ground, though some species do nest above ground. Number of bees in a nest is anywhere from 50-400 bees. Bumble bees are furry and black with some yellow markings. Colors can vary among species. They are known to have a habitat that is higher in altitude and latitude than other bees. Carpenter Bees are a solitary bee and like their name implies they burrow holes in exposed wood to lay their young. 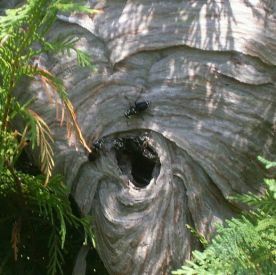 A female carpenter bee will drill a perfectly round hole about a half inch in diameter and then make a 90 degree turn burrowing down the length of the wood. She can lay from 6 to 10 eggs in a burrow. The following year the burrow will be reused often by lengthening it. Males are very territorial and will buzz close to those passing by. Males are not able to sting though. Females can sting but rarely do. 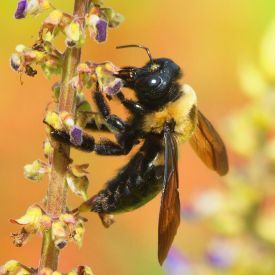 Carpenter bees are larger than bumblebees and not as furry. They are mostly shiny black with some yellow. Carpenter bees can be a real problem in warmer climates such as the southeast. Log cabins and wood homes have seen serious infestations. The wood is destroyed as the bees burrow holes over and over again. Woodpeckers can also damage the wood further by eating away at the larva inside the holes. To get rid of a carpenter bee problem it may be necessary to have a pesticide application once or twice every year. Southeast Bee Removal does not deal with carpenter bees. The most common wasps in North America are both red and yellow paper wasps. They are social wasps but do not build a large nest; it is up to the size of a softball. Their nest is an open-faced nest with the cells hanging downward. They live under decks, overhangs, and attics. Wasps can get trapped inside your home, looking for a way to get out in the spring or a place to overwinter in the fall. Wasps can find ways in through chimneys, vents, and construction gaps in the duct work. Southeast Bee Removal does not deal with wasp nests. Cicada killers are solitary wasps measuring about two inches long. Their huge size makes them look scary but they really don't bother people. The males, although territorial, can't sting. The females are not aggressive and may only sting if stepped upon or crushed by the hand. Eastern Cicada killers resemble European hornets but are bigger and darker looking. Their coloring is black with reddish markings and light yellow stripes on their abdomens. Cicada killers will emerge from holes in the ground in June or July and live until September or October. These wasps got their name by killing and feeding on cicadas. Southeast Bee Removal does not deal with cicada killers. Mason bees are commonly mistaken for honey bees as they look somewhat similar. However there are a number of differences that will help you determine what kind of bee you are dealing with. Mason bees are a solitary bee and are usually seen in small numbers from several to a couple dozen, whereas honey bees typically come by the hundreds and by the thousands. Mason bees also are darker in color than honey bees, have longer antennas, a shorter abdomen, and are slightly smaller. I have often seen mason bees make their home in the weep holes of brick structures. These small weep holes provide ventilation and allow moisture to escape. Stuffing wire mesh into the hole can be effective in keeping bees out while still keeping the brick breathable. Sometimes in early spring, as the mason bees emerge from hibernation a couple can get trapped inside your house. This usually is nothing to worry about and may only continue for a week or so. Mason bees are not aggressive and pose little threat in damaging your home. Like many species of bees, the male does not sting. The female typically will not sting unless squeezed in the hand.